« New eBook and Giveaway! Contest: Buy “Winner” and Win a Special Prize! I am excited to announce my first ever giveaway for readers, the “Buy Winner & Win” contest! In honor of Winner, my new eBook about a teenage girl who’s hooked on winning, I am hosting — what else — a competition! I am offering a special prize to one lucky reader who will be picked at random using Rafflecopter. All you have to do is buy a copy of Winner or Unlucky 13 between December 17th and December 31st, 2013, and email your receipt to info@kristinaludwig.com. You can also gift one of the books to as many people as you want – and forward me the receipt. You will receive one more entry for every gift you make! Write an honest review on Amazon and you’ll receive one more entry in the drawing. Just forward your Amazon.com Review confirmation email to info@kristinaludwig.com. All participants will then be entered to win the Kindle Paperwhite. Drawing will happen in the first week of January. The winner of the Paperwhite will be announced on this blog, and will also be notified by email. 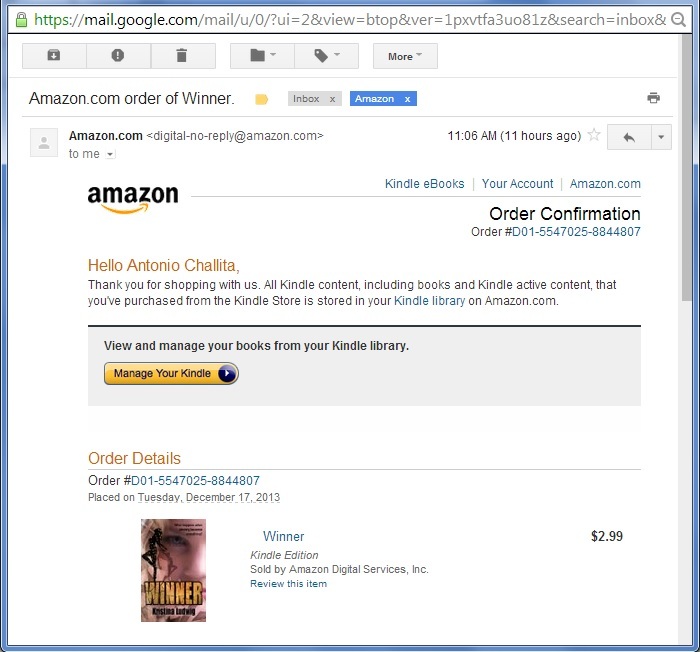 Here is an example of the email receipt. All you have to do is forward it to enter the contest. Good luck!